Today my husband and I attended the Pennsylvania Conference for Women at the convention center in Philadelphia. At the conference, a number of women making an impact in the world including Gloria Steinem, Jessica Alba, and Joanne Ryder, shared their stories. This conference was conceived ten years ago by the Pennsylvania Commission for Women under then-Governor Ed Rendell and has since grown to reach thousands of Pennsylvania women. This year, there were approximately 9,000 women in attendance. It is a gathering dedicated to the issues that matter in a career – networking, professional development and personal growth. But it’s also a gathering dedicated to the things issues that matter to a healthy functioning society. It is a gathering place for women who want to make Pennsylvania better. That’s precisely what my husband wants for our commonwealth. But it’s what we can’t have as long as we have gender inequality in Pennsylvania. Despite our half-century old equal pay law, women make only 76 cents for every dollar men make. That is just plain wrong. Tom and I are the proud parents of two talented daughters, one of whom is an architect and one who is a geologist. Tom has smart and talented women serving as his Chief of Staff, as his General Counsel, and in a number of important positions in his executive staff and cabinet. He also recently announced the launch of the new Pennsylvania Commission for Women, which is made up of a very talented and dedicated group of Pennsylvanians, who will act as tireless advocates on behalf of Pennsylvania’s women and girls. It’s wrong from a moral and political sense that women are not given the same opportunity as men. But it’s not only unfair, it’s just plain bad policy. Gender inequality keeps Pennsylvania from deriving the full benefits of its talented population. It keeps us from taking full advantage of all the human skills, experience and insights we have here right in our own backyard. Discrimination of any sort shrinks our talent pool and it just doesn’t make sense. From a purely self-interested point of view, we need to make sure the talent pool we draw from is as large as possible in our businesses, in our schools, and in our government. We need to work together to stamp out discrimination and resolve to level our playing field not just because discrimination is morally repugnant, but because it’s also smart policy. Pennsylvania should embrace the practice of fairness to show that we are smart and sensible. We need to work to make the world a fairer place. That is clearly good for not only the women of Pennsylvania, but for all Pennsylvanians. 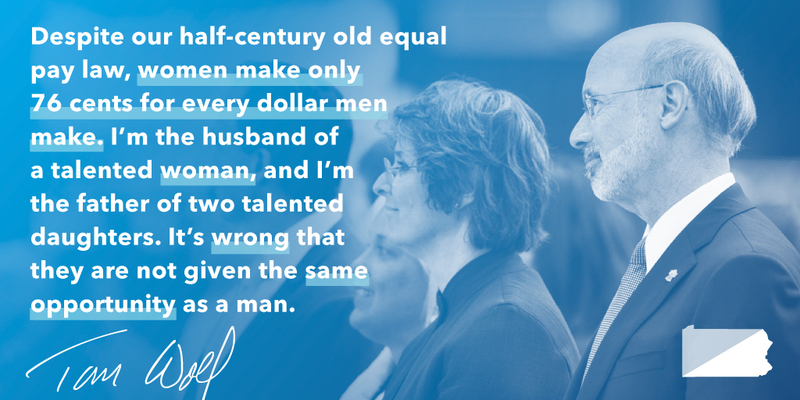 I’m proud of the work my husband does every day to make Pennsylvania a more fair community.